Xiaomi actually started the war against smartphone bezels with the Mi Mix in 2016 before other OEMs decided to follow suit. They’ll be releasing the sucessor of the Mi Mix on 11th September. This information was shown on a post on Chinese social networking site Weibo. Nothing else about the phone has been officially confirmed yet, although some speculations so indicate the device may come with a dual rear-camera setup. 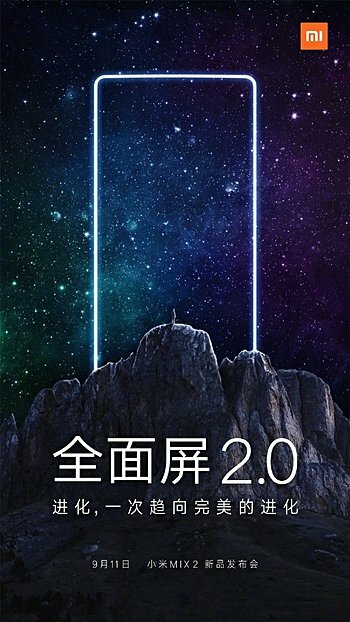 It’s very likely that the bezels will be even thinner this time, and the handset is also said to offer 3D facial recognition support. Coming to Specifications, It may come with a Snapdragon 835 SoC, 6GB RAM, and Android 7.1.1. However, another rumor suggests that it may come with Android 8.0 Oreo and a Snapdragon 836 SoC under the hood (the same processor on the Google Pixel 2) The Mi Mix 2 is rumored to sport a 6.4-inch AMOLED display with a 2540x1440px resolution, and come in 128GB and 256GB storage options. Battery capacity is said to be 4,500mAh.